I've lost 7st 7lbs105lbs47.5kg – it took me exactly 12 months. I'd been overweight for years and it was affecting my sleep (I had sleep apnoea) and my health so I knew I needed to do something. 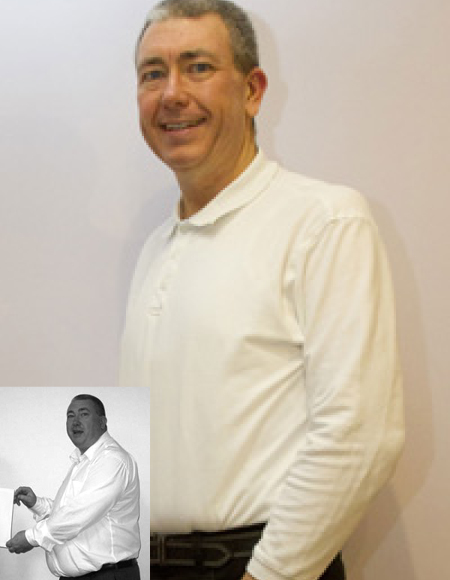 It was a colleague at work who had lost 5 stone that really inspired me to get started. I found the app on the Apple Store and read the reviews. Before I started Nutracheck my weight had just crept up year on year, for the past 25 or so years. It was a challenge at times, but I was determined! Being away from home – I often have to travel for work. Fabulous – so much better, more alert and able to enjoy life. My sleep apnoea has gone & my blood pressure is ideal. I set myself an initial target of losing 5 stone in 8 months, which I achieved over 2 months early. I felt so much better and motivated that I decided to carry on to achieve my final target and healthy BMI in 12 months. All of my health indicators are now good, my sleep apnoea has completely gone, my blood pressure is in the ideal range, as is my cholesterol. PLAN AHEAD - ensure you know what you'll be eating when, especially if you have a weak time - e.g. when you get home from work. Keep healthy snacks available at all times. When eating out, look at the menu in advance and choose a healthy option. COUNT EVERYTHING - do your best to honestly count every calorie. Put all you eat and drink into Nutracheck, and all your exercise. And keep doing it. Become obsessive about it. If you can't weigh/measure the exact quantity make your best honest estimate. STAY IN CONTROL - don't let events or other people knock you off you plan, be determined. I've found when I asked people for their support that they reacted positively and helped me, including people at work and staff in restaurants. How long have you been maintaining your weight loss now? How easy are you finding it to maintain your weight? It's certainly easier than losing it, but I still have to stay disciplined, I still record everything on Nutracheck and use the tips and tricks I learned whilst losing weight - if I don't my weight starts to creep upwards again. I've allowed myself more treats into my eating regime again now, and don't worry if I have the odd treat day with no counting, especially for special occasions. About once a week, usually first thing on a Saturday morning. Yes, I also take photos of the reading on the scales on my phone! How much does your maintenance weight fluctuate by? What do you do if you've gained a few pounds? I aim to stay within 4lb either way of my target BMI, if I go above this then I just reduce my daily calorie allowance and stick rigidly to plan until I'm back below my target weight. Take up some exercise - I hated exercise but am now running 5km+ two or three times a week to keep fit (it's so much easier now I've lost weight) and the exercise really makes me feel better. I used the NHS couch to 5k programme to start me off. How confident do you feel that you will be able to maintain your new weight for life? I'm not as confident as I would like to be, but I am determined!